Thank you for your support of The Woolery Weave-Off! As I write this blog entry, it occurs to me that every day, everywhere, we are surrounded by bad news. Wars. Fiscal crises. Crippling poverty. Water accessibility. Hunger. It is a tumultuous time in the world, and it is safe to say that the inundation of upsetting daily news is exhausting to everyone. Compassion fatigue, some call it. When do we get a break from the bad? For me, the break in the bad has been this contest. Every day since February, we have received envelopes carefully sent to us containing hand woven dishtowels. Some are bright. Some are neutral. Some are from beginners, and some are from experienced weavers. They vary in size, in pattern, in colorway. Some have fringed edges, some are hemmed. Waffle-weaves, crepe-weaves, twills, and plain-weaves. They are all as different as the ways of the wind – there are not two that are similar. What they all have in common, though, is the obvious love with which they were woven. Beautiful notes accompany many of them expressing the delight to have a reason to warp a loom for a good cause. Some entries recount time spent in unsure housing circumstances themselves, and the frustration felt at having next to nothing, and definitely not much ‘nice’. One entry confessed that she wove it oversized so the owner, clearly in a tough time of life, might be able to use it for something other than just dish drying (that one caused me to burst into immediate tears). A generous donation came from a sweet 12-year-old weaver, who acknowledged that she was unable to officially ‘enter’, but wanted to contribute alongside her mother’s submission. 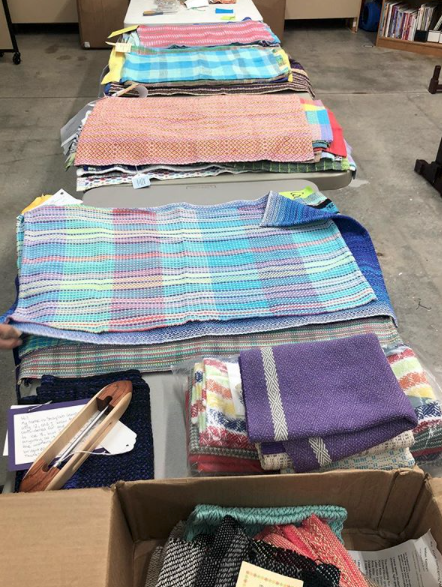 A school in Pennsylvania sent in a box of beautiful towels, despite many of the weavers being under 18 themselves. Some entrants added matching wash rags, some sent duplicates and multiples, just to bolster the donation amount. The break in the bad. As a woman and mother myself, I understand how stressful having young children can be, even on a good day, in comfortable circumstances. To add in the enormous stress of being housing insecure, feeling untethered to a stable life, must be overwhelming. As women and their children move out of The Simon House, into new apartments, they often do so with nothing. What they do have is usually donated, having once belonged to another family. Bare bones, and precious little luxury, but a new beginning. So lovely, well made, practical, and prettyare these dishtowels, that despite how utilitarian they may seem, the women who receive them will confidently possess at least one beautiful, brand new, high end thing that is hers. In the mundane tasks of putting away dishes, bathing the baby, wiping down the high chair at the end of a long day, there is guaranteed to be a bright spot when the owner gets a flash of a lovely, fun pattern, pleasing colors, and quality that gets the job done, only softening and becoming better with every wash. How many of us have a favorite dishtowel? I know I do. One small, reliable bright spot in the day. A break in the bad. 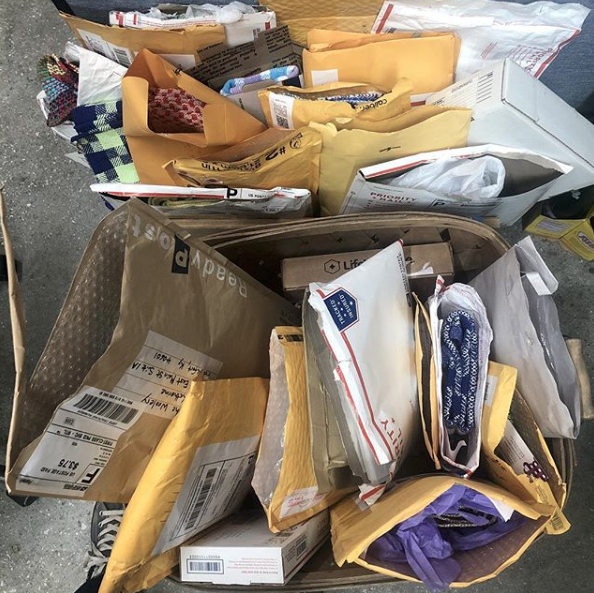 The generosity, and more importantly, the empathy shown in these wonderful donations have been heartbreaking in their beauty, kindness and love, compassion, and obvious understanding of a less-than-ideal situation. One nice item, made just for them, that will last, wear well, and always be something enjoyable to use and look at. A break in the bad. On behalf of the entire Woolery staff, the McFarlands, and our extended Woolery family, I thank you all from the genuine bottom of my tear-soaked, but now much larger heart. To be reminded of the love and generosity that exists in this chaotic world is a morale boost I desperately needed, and am so glad the ladies they will benefit get to experience, too. Your true, warm colors all came shining through with this act of generosity. Thank you for this break in the bad.